So Kat’s parents are partly responsible for her love of everything vintage. They always had classic cars (a lime green hot rod with flames on the side and a turquoise mustang). But it wasn’t until fashion school that Kat started developing her love of the rockabilly style. She was asked to make a range of clothing that best suited her family’s style and that’s when she went down the rockabilly rabbit hole! She started investigating everything to do with Rockabilly and found the likes of Sabina Kelly, Cherry Doll Face and Heidi van Horn. Armed with vintage editions of Women’s Weekly that she worked on perfecting the hair and makeup looks. All the while Kat was running a successful business that started from her high school backpack! At just 16 she started making retro jewellery and accessories. And not having a store was not a problem! She took them to school where girls who weren’t into the retro scene snapped them up, including a young Iggy Azalea. With the power of social media Kat took My Little Rockabilly online and started Facebook wars. Thousands of girls would log on every Wednesday at 6pm to try and score a piece of Kat’s hand made jewelry. On a good night she would sell 300 pieces in an hour! Since then My Little Rockabilly has expanded and now saves and restores vintage furniture. She finds pieces from the tip, the side of the road, garage sales and furniture that people don’t want and makes them great again! Bright colours paired with other bright colours, leopard print giving mid-century furniture is given a new lease on life and made to look a little more at home in modern lounge rooms giving them an extra 30 or 40 years of life. And through all this Kat’s love of vintage cars has not faded! She loves, loves, loves her 1964 Tiki Wagon that she and her dad did up. She has a vintage caravan that has been converted into a moving stage that she uses for the events she plans, including the Gold Coast Design Collective Markets. And in her spare time between all of this, Kat has an incredible vintage collection of everything from guitars to hats and dresses that were costumes in the Phar Lap movie Utopia Road. Oh and she also wants to start a Rockabilly band – so if you are a musician looking for a talented, rockabilly queen then Kat’s your gal! Thanks so much for listening and we will see you next week with another fabulous vintage story! 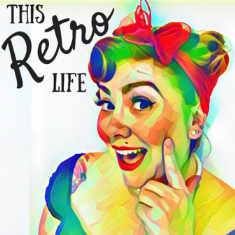 Listen to Episode One of This Retro Life.